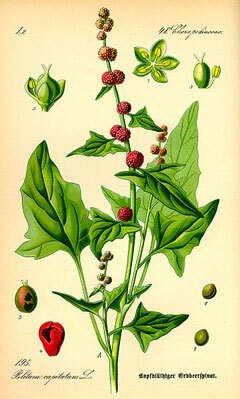 Chenopodium capitatum. Plants for a Future. www.pfaf.org. (Accessed 5/2014). Chenopodium capitatum is an annual, C3 herb (Jacobs 2001), 20-60 cm tall, branched from base. Leaves alternate, stalks of lower leaves longer than blade, upper stalks shorter, blade triangular to arrow-shaped, to 10 cm long, margin toothed. Flowers minute, red in small rounded clusters. Fruit dry, 1-seeded, surrounded by fleshy, red calyx. Origin: Native, a northern species. Habitat: Open areas in woods.